Grease or line a 9×9″ casserole dish. Bring milk to a boil in a large saucepan. Stir rice and salt into milk, reduce heat to medium-low, and cook, stirring frequently, until rice is tender, about 20 minutes. Beat egg yolks, 1/3 cup sugar, butter, and vanilla extract together in a bowl until combined. Stir 1 cup of the hot rice mixture into egg mixture until well-mixed. Pour egg mixture into rice mixture in the saucepan; bring to a boil, stirring constantly, until mixture thickens, about 1 minute. Pour into prepared casserole dish. Beat egg whites in a glass or metal bowl until soft peaks form. Gradually add 3 tablespoons sugar, continuing to beat until stiff peaks form. Lift your beater or whisk straight up: the egg whites will form sharp peaks. Spread egg white mixture over rice mixture, ensuring that egg whites are spread to the edges of the casserole dish. 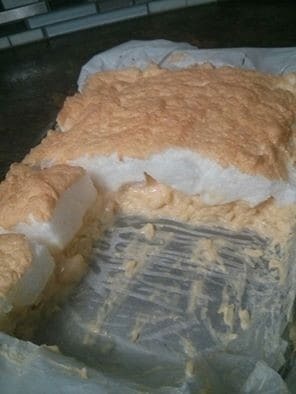 Bake for 15 to 20 minutes or until the custard has set and the meringue has browned.